Snippets of Jack: "And Marty the dwarf!" Now continouing with the theme of celebrating our great motley crew I will post all about Marty. 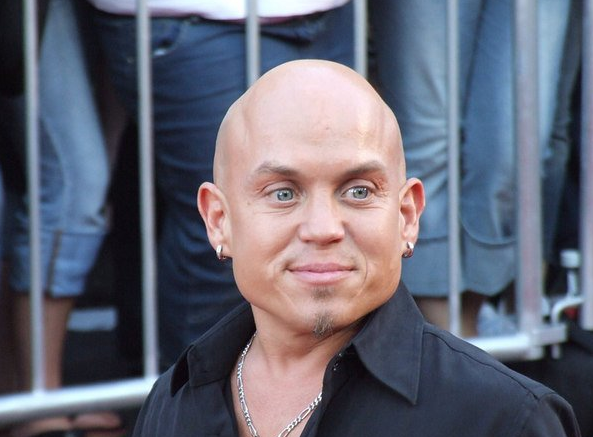 I'll start with some interesting facts about the actor who portrayed him, Martin Klebba. Now Marty wasn't always called Marty. The film-makers had decided to call him Dirk and last minute they switched his name to Marty because it sounded more like the actors name. 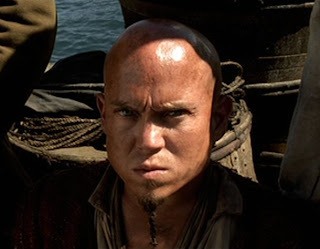 Klebba also portrayed the Butcher in the play on Snow White Mirror Mirrror, some guys pet in Planet of the Apes, a small alien in Men in Black and many more films. But now let's get to the good stuff. We all know Marty is a little smaller than most sailors but was considerably strong. Of course in Pirates of the Caribbean: Curse of the Black Pearl the camera zooms in on the first of Jack's recruits and slides across all the faces of the new crew members. Until of course it comes to Marty who's head is much lower. Marty and the rest of the crew sail on to the Isla de Muerta on the HMS Interceptor. When they reach the island Jack and Will go a shore while the crew stays on board. Only Will and Elizabeth return which upsets the loyal crew. But they keep to the code: "Whoever falls behind, is left behind." While sailing away from the isla de Muerta the Black Pearl, captained by Barbossa with Jack in the brig, is gaining on them. So the crew prepares to fight. Marty starts manning a mini cannon and shoots at the Pearl to the dismay of Jack. I must say that mini cannon does suit Marty. When he runs out of cannon balls for his cannon Marty goes below deck to help Gibbs man a large cannon. Remembering Will's speech about firing everything they have, Marty helpfully grabs Gibbs' bottle and fires it at the Pearl. It hits the place where Jack is and breaks the lock to his cell. However the Interceptor is no match for the Black Pearl and he and the others are captured. The cursed crew leaves Jack and Elizabeth on a deserted Island where they are picked up by a passing ship and taken back to Port Royl. In Port royal they tell the commodore about the pirates and convince him to sail to the Isls de Muerta and kill the cursed crew. Mean while Barbossa, now in possesion of the 882 coin, sets sail for the Isla de Muerta where he will spill wills blood with the coin, freeing him and his crew of the Curse. When they reach the island the Dauntless is already there with Jack and Elizabeth and a bunch of Royal Marines, but they are out of sight. While the cursed crew is on the island Elizabeth comes aboard the ship and frees the crew. The crew then takes the ship and sails away, leaving Elizabeth and Jack on the island. Unfortunatley Jack is caught by the navy after the battle aboard the Dauntless and is taken to Port Royal to be hung. But as we all know he "escapes" by falling of the cliff int the ocean, but luckily Jack's loyal crew come and saves the day in the Black Pearl and making Jack they're Captain.